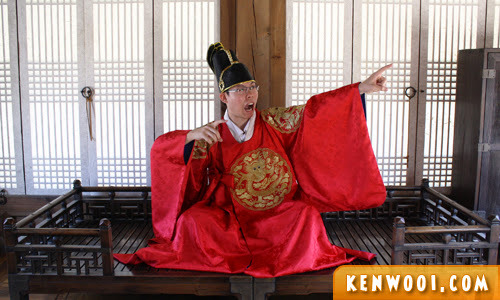 It’s easy to enjoy and learn about traditional Korean culture in Seoul. 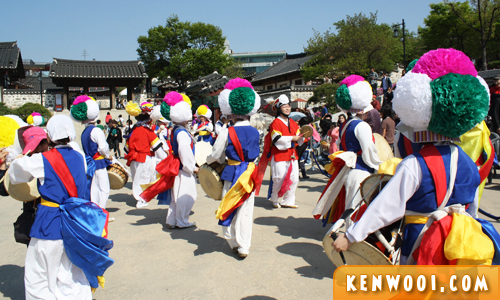 Besides the grand palaces of Seoul, visitors can also experience the Korean culture via Hanok Villages. Therefore, during our visit to Seoul, we dropped by the Namsangol Hanok Village, which is located pretty nearby to the N Seoul Tower. Namsangol Hanok Village is a traditional village set up with well-preserved Korean-style houses, called the hanok. Old household items are displayed in traditional houses to recreate a village of the Joseon Dynasty. Travel Tip: To reach Namsangol Hanok Village via the Seoul Subway – get off at Chungmuro Station (Exit 4). 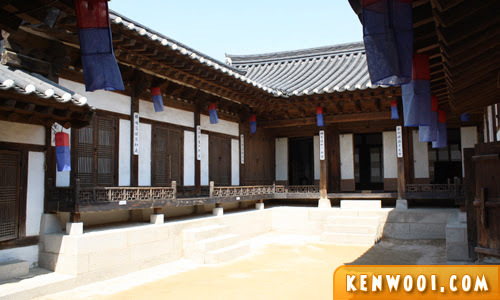 In order for the visitors to catch a glimpse into the lives of the Korean ancestors, five Hanok houses were actually moved here from the original location. The various types of furniture and household items represent the social status of the people who lived there back then. Over here, visitors can observe the culture of Joseon Dynasty and then participate in traditional cultural experience programs held every day in the village’s vicinity. On the day we were there, there was a cultural performance by a musical group with traditional Korean drums and colorful costumes. Besides that, the Koreans hang out at the park within the village. Since the weather is cooling, they would be gathered and seated on the grass, socializing with each other. Apparently they DO talk to each other – I thought they’re always staring at their smartphones. Saw some interesting traditional hanok architecture and whatnot. But what amused me was the fact that the height of the doorways throughout the village was quite… low. I don’t like to assume, but does it mean that the Koreans back then were… kinda short? Or else they would have built the doorway roof higher, right? Anyway, there are also cultural experience activities organized in the village. 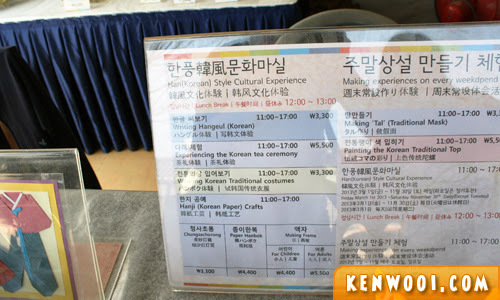 The entrance to the Namsangol Hanok Village is free, but the activities come with a small chargeable fee. Korean kids (accompanied by their parents or adults) are very into this activity. 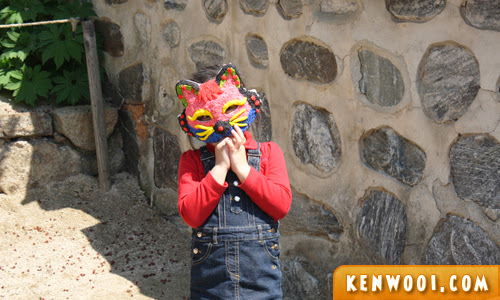 They would be excitedly painting Korean traditional tops or making traditional masks. She aspires to be Cat Woman, I think. Meow! Anyway, the cultural activity that attracted us the most was wearing Korean traditional costumes. The fee was KRW3,300 (RM9.40) per person. Before getting into the costumes, I got a photo with the Korean lady who was in-charge of the activity. She was the one who helped us with the costumes. To be honest, I don’t really fancy the idea of wearing costumes. You see, I’m such a modern Chinese that I don’t even dress up in traditional Chinese costumes. 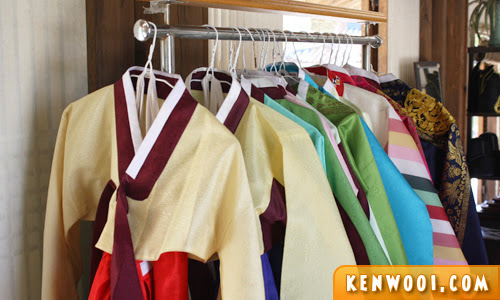 So, what more wearing Korean traditional costumes? 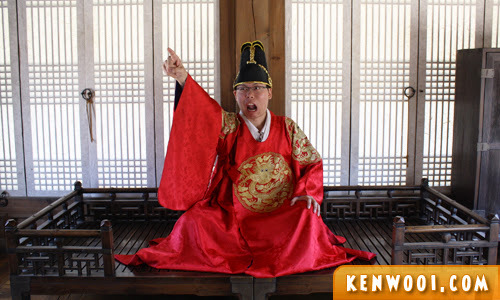 But when I finally wore the traditional Korean Dragon Emperor’s costume… I transformed into a Korean emperor – a very furious one! Rawr!!! 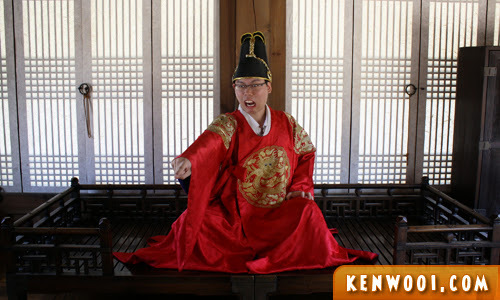 I am Emperor Ken-wu, ruler of the Kenseon Dynasty! You shall heed my command, or suffer the consequences! You peasant, where are my oranges?! I am hungry and I want my oranges! Now! Today we will rulez the world with our K-pop! Bring on Psy, G-Dragon, Wonder Girls and all those sissy looking boy bands. They will make Korea famous!!! Oh well, a King’s gotta do what a King’s gotta do! Namsangol Hanok don’t sound like Korean. Sounds like Klingon or something. LOL. I followed a tour to that site during the Winter but there was no cultural dances or traditional costumes to wear. You had so much fun.